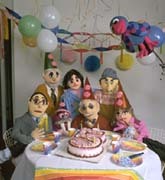 Poko Puppets has created hundreds of puppets and appeared in dozens of commercials, print ads, industrials, and television productions. We are available to design, create, and bring to life any type of characters. We can work from existing storyboards, or completely conceive a project, providing all aspects of the production. We are specialists in taking technical information and translating it visually into the puppetry medium. Our clients include Sony, AT & T, Hershey Chocolate, Canon USA, Prudential Life Insurance, Johnson and Johnson, Pepsi, Capital One, Scholastic Magazine, Better Homes and Gardens, McGraw Hill, and many others. Click arrow to begin video. See the following two articles for additonal information.